I'm a Ph.D. candidate in Organizational Behaviour at Queen's School of Business in Kingston, Ontario, Canada. My interests include trust, conflict resolution, negotiation, and forgiveness. Do Markets Make Us Trust Less… Or More? In a famous experiment I’ve mentioned here before, you get different results when an economic game is titled the ‘Community Game’, versus the ‘Wall Street Game’. Despite the exact same rules, structure, and payoffs, the frame changes the game: Wall Street players cooperate less than Community Game players. But, Alex Tabarrok at Marginal Revolution points out some recent results that suggest that it may be Wall Street in particular that is triggering suspicion, not markets in general. 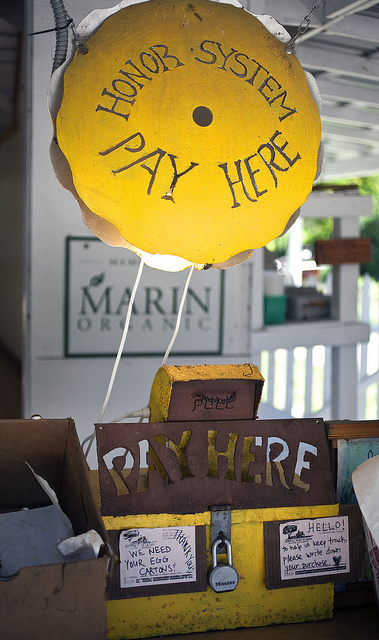 The study described over at MR primed markets in a different way, getting participants to rearrange sentences that had words related to markets, commerce and trade: “Paid”, “commercial”, “shop”, etc. (A control group of participants rearranged similar sentences with different, non-market words). What they found was that priming markets increased players’ trusting behaviour in an economic trust game. It’s hard to know from their results whether this is really trust, or simply willingness to take on risk. Perhaps both market-primed and non-market-primed players are equally suspicious of their partner in the game, but market-primed players are more willing to gamble. Though more work probably remains, it’s an interesting result, and suggest to me that it’s worth thinking carefully about the distinction between markets and business when we think of economic influences on trust. Edit: Via Thomas Zeitzoff, another interesting related paper in Science: In behavioural games, players in societies with well-developed markets (operationalized in terms of how much of your food is purchased rather than grown yourself) tend to play with greater concern for fairness. How does being trusted make you feel? So much of contemporary life seems designed to make you feel distrusted: The big-box employee checking your receipt as you leave the store. The piles of legal boilerplate firms will make you sign to prove you’re going to keep your mouth shut about their trade secrets. The keylogger your employer installs on your work computer to make sure you’re not goofing off. Late last year, though, I had a very different experience at a Stella’s near my office on campus. After having lunch, I went to pay, and found that the store’s debit-credit machine was on the fritz. Having no cash on me, I was in a bind. I started suggesting options — I could leave my driver’s license as collateral and run to an ABM, and then — when the server cut me off. “Don’t worry about it. Just give me a call with your card number later, and we’ll run it through then.” I asked whether she wanted to write down my name, or take a business card. No on both fronts. I ate my meal, left without paying, and they took my promise to settle up at face value. After calling in to pay, I asked the manager about what usually happened when this kind of problem occurred. Some customers would sprint to an ATM while others would take weeks to pay it back, but only two people in the manager’s memory had ever failed outright to return and pay for their meal. There’s less research than there ought to be about mutual trust and feeling trusted (most research still focuses on why we trust others, rather than the experience of being trusted), but the evidence suggests that there are some pretty substantial benefits to making people feel trusted. Sabrina Deutsch Salamon, for instance, looked at employees in 88 retail stores. When employees collectively felt that they were trusted by their managers, they were more likely to endorse “responsibility norms” (feeling accountable for the store, for instance). These responsibility norms, in turn, predicted the employees’ performance in sales and customer-service. Of course, there’s a Pygmalion effect at play: Those who are trusted are more likely to be charged with the resources and tools to do a good job. But there’s also a powerful influence of others’ expectations on our own choices. When we’re presumed to be shoplifters, swindlers and slackers, we feel less bad engaging in those behaviours. But when people show their trust in us, we often respond by trying to prove them right; trying to show that the unearned trust placed in us is in fact warranted. Teaching this term, of course, this leaves me with a challenge. Exams and quizzes, being beset by issues of cheating and plagiarism, have developed an apparatus around them to monitor and control student behaviour. The message that is very clearly sent is this: You aren’t to be trusted, and we’re keeping an eye on you. If you reflect on your own work, in what subtle ways do you communicate to those around you that they are trusted or distrusted? — Ena Inesi, Deb Gruenfeld and Adam Galinsky, on how power can reduce trust in others. When people are powerful, they argue, it makes others’ seemingly trustworthy behaviour seem ambiguous. Are others acting benevolently because they are trustworthy, or are they just trying to toady the powerful in the hopes of capturing some of their power? Interestingly, this cynicism also had the effect of dulling thankfulness. When people felt powerful, they thought others’ helpful behaviour was actually self-interested — and as a result, they felt less thankful for the help. So, where does entitlement, the idea that you owe no gratitude for that which you receive, come from? Based on this research, one answer is that it stems from feeling powerful. Returned today from the first day of my faculty orientation at the University of Manitoba. Our President began the day by sharing a poem with us. It really struck me, and I thought I would share it here. On a shoulder. The generous are still a glow within. As they nourished seeds to flower for a while in me. Nipping the buds of younger and younger threats. The turning point and I face both ways like Janus. Recall how terribly you needed praise. Then choose. Is low trust a symptom of psychotic illness? No, you’re not suffering from psychosis just because you don’t trust people. But relative to healthy control patients, both those with psychotic illness and their at-risk relatives have lower levels of trust. And, those who suffer from psychotic illness have a hard time adjusting their trusting behaviour to suit the trustworthiness of the person they’re dealing with. (Fett et al., 2012, Brain). Do high trusters see fairness around them? Why do people high in dispositional trust (the tendency to trust people in general) feel more committed to their work? This recent study shows that high levels of trust lead people to view their work settings as having more procedural justice (fair processes), increasing their commitment. And, because I know what you’re thinking, it’s not just because high-trusters are lucky enough to land in better, fairer workplaces. The authors showed high- and low-trusters identical workplace scenarios, and found the same result: High trusters saw the same workplaces as having more procedural justice than low trusters. (Bianchi & Brockner, 2012, Organizational Behavior and Human Decision Processes). Does trust travel? Trust varies a great deal between nations and cultures. But when people immigrate, do they retain the trust norms of their country of origin, or adopt the trust norms of their adopted country? In an interesting study carefully matching immigrants with very similar nonimmigrants, the authors find that the destination country has a “massive impact on trust”. In other words, trust attitudes apparently don’t get packed in the suitcase when people move countries. (Dinesen, 2012, Political Psychology). When doesn’t joining clubs help build trust? Voluntary associations (clubs, leagues, associations, etc.) are a cornerstone of social capital. The more people belong to organizations, particularly ones that bridge together very different people, the more people tend to trust others outside their close circle of friends and family. Except, some new research shows that inequality short-circuits this nice dynamic, and weakens the positive effects of civic engagement in voluntary associations. Why? “When a society experiences a high level of income inequality,” the authors explain, “social distances between economic groups are so wide that even members of a voluntary association would be divided along economic lines, thus nullifying connecting effect of group activities.” (Park & Subramanian, 2012, Social Forces). How Audacious Should Your Negotiation Goals Be? How ambitious should your goals be when you negotiate? Is your answer “ambitious to the point of lunacy”? Some new research by two Georgia State University researchers (Ed Miles and Beth Clenney) looked at the effect of setting extremely challenging goals in negotiation. What was ‘extremely challenging’? In their study, it involved creating every possible dollar of value by making perfectly efficient tradeoffs, leaving not a single dollar of value ‘on the table’… and then, with that in place, claiming 130% of your even share of that value. Negotiators rarely are able to squeeze every bit of value out of a negotiation. Previous research shows that getting 104% of the “fully symmetrical integrative solution” (the every-last-drop-of-shared-value deal) is extremely difficult, even for skilled negotiators. So thinking you’ll get a fully-optimized deal, and then walk away with about a third of your counterpart’s share on top of your own? Welcome to the border of ambitious and crazy. But these lunatic goals seem to work. If you go toe-to-toe with someone who sets themselves a merely difficult-but-attainable goal, the researchers found, you’ll take their shirt (in their experiment, the crazy-goal folks walked away with about 35% more than their counterparts, despite entering the negotiation with the same amount of power). So, you might ask, should I have any bounds to my avarice when I negotiate? Well, probably. Remember the idea of the ‘fully symmetrical integrative solution’? Where both sides trade things they care about for things they don’t, and make those trades perfectly efficiently? It turns out that when either side walks into a negotiation armed with crazy-person goals, they don’t come close to reaching this integrative solution. This graph shows the total joint value. That’s how much value got created by making helpful-to-both-sides tradeoffs. See what happens? If even one party has an extreme goal, the ability of the negotiating pair to make mutually-beneficial tradeoffs plummets. Why might this be? Well, the researchers found that negotiators with extreme goals tended to make gutsier first offers. I’m going to guess that they probably do a number of other things. If they’re going to walk away with all of their own pie and some of yours to boot, they’re going to have to appear iron-willed and make you cast doubt on the strength of your own position. That may lead them to disguise their real positions and alternatives, introduce misinformation, and appear unyielding in their demands. Contrast those tactics with the ones you need to find shared value: Asking questions, sharing information, exploring alternatives. You start to see why even one extreme-goal negotiator could short-circuit the process of finding mutual gains. Will I end up resorting to tough-guy tactics to meet an extreme goal? Extreme goals are powerful, but they can lead you to miss all the nice potential for joint gains in a negotiation. 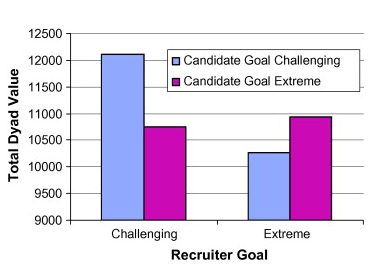 If you think setting an extreme goal is going to lure you into browbeating your counterpart instead of asking questions and finding shared solutions, avoid extreme goals. Where is most of the value in this negotiation? In this study, it looks like the gains are largely related to claiming value (bartering over how to split up the money), and the losses relate to creating value (finding clever ways of making everyone happier at little cost, or trading priorities). If your negotiation is a one-shot, zero-sum bargaining situation, extreme goals might be more helpful. If your negotiation is complex, with lots of different issues and parties who both have different priorities… well, you might want to steer clear. Can I parry effectively against my counterpart if they have extreme goals? From these data, you don’t want to bring sensible goals to a crazy-goal fight. So, you need to ask yourself: If the other person arrives full of impossibly ambitious goals, can I effectively avoid being drawn in by their tactics? Mitt Romney, it turns out, was a rather awful bully in high school. In one incident, he pinned a kid down and forcibly cut off his hair. But this, of course, was decades ago. And as Steve Saideman notes, the statute of limitations we place on politicians tends to vary considerably on whether the offender shares our partisan stripes. We hold our opponents accountable for actions far older than the ones we’ll hold our own candidate to account for. So why is this a story? There’s some interesting research on the effect that insincere apologies have on victims and on others. In a series of experiments, Jane Risen (Chicago) and Tom Gilovich (Cornell) compared three types of responses to a transgression: Apology, no apology… and a insincere, forced apology. They found that direct victims will accept even insincere apologies, largely because victims fear looking dislikable if they don’t accept the apology. But folks other than the victim aren’t bound by these same concerns. Risen and Gilovich found that observers (like those of us not actually bullied by the teenaged Romney, but who have read his insincere apology) are actually made more vengeful by a bad apology than no apology at all. When apologies are effective, it is because they take responsibility and demonstrate remorse. If Romney had acknowledged the harm he had done, if he showed that he knew why his behaviour was so hurtful, if he showed capacity for empathy with his victims — well, you’d be a pretty petty partisan to hold a grudge for the idiocy of his teenaged years. But with his mealymouthed non-apology, all he does is implicitly accuse the victim of being oversensitive, and demonstrate that he doesn’t fully understand the hurt he caused. I suppose the message here is — for politicos and others — don’t apologize until you are ready to properly apologize. There’s evidence that late apologies can be better than early ones, because victims feel that later apologies come after their perspective has been heard and understood by the offender. So, apologize only once you’ve really sought to understand and empathize with the person or people you harmed. Apologize only once you’ve stopped deluding yourself that you were somehow not responsible. And apologize only once you’re willing to admit your mistakes with candor and apologize for them with sincerity. Why Does Distrust in the Media Matter? … Because when people distrust the media, their attitudes become rigid, shaped by empty partisanship, unshakable by new information or evidence, explains Jonathan Ladd in a new post at the Monkey Cage (link above). Interesting reading. Is inequality linked to cheating? An interview I did recently with San Fran public radio about my research on inequality, trust, and academic dishonesty.